All of David's programs center on his science-based, field tested formula for individual, team and organizational success. David's programs give you and your employees the strategies, tools, and plans you need to grow your business. How living a fulfilling life and navigating negativity successfully every day--personally and professionally--lead to increased employee engagement, outstanding customer service, and superior business results. In this program David reveals his trademarked secret for increasing excitement in your job, the passion in your career, and the difference you make to your teammates and customers. David also teaches you how to deflect the negativity that derails your goals and leaves you stressed. This talk is based on David's highly acclaimed, science-based book, The 3 Promises, and his international best seller, The Law of the Garbage Truck-translated into 12 languages. Increase joy, creativity, and innovation by learning how to regularly activate your positive emotions and the positive emotions of your teammates and your customers (The 1st Promise: FIND JOY). Increase employee engagement by learning how to tap the natural strengths and passion of your teammates and customers (The 2nd Promise: DO WHAT YOU LOVE). Increase giving, sharing, and teamwork by learning how to make a difference every day for your teammates and customers (The 3rd Promise: MAKE A DIFFERENCE). 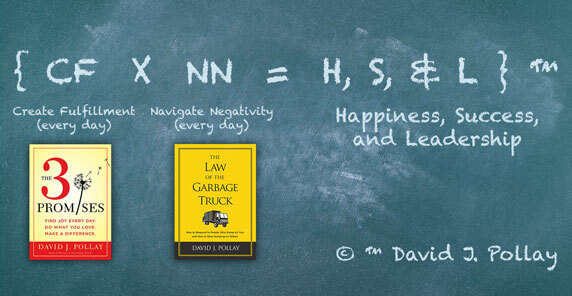 Combat needless negativity, excessive complaining, toxic worrying, rumors, gossip, and ungrounded criticism by learning how to use David’s world-famous THE LAW OF THE GARBAGE TRUCK. Strengthen your relationship with your boss, and work better with difficult teammates, by learning how to activate the 3 Promises in them. Create an immediate plan to increase your joy, passion, and contribution at work and at home by taking The 3 Promises 3-Day Challenge.